What is puppet, how puppet works? 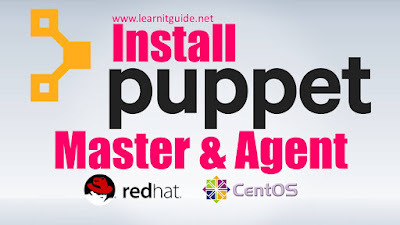 How to install puppet master and puppet agents? 1. Make sure both server "puppet" and "client1" are accessible. 2. Make an entry of each host in /etc/hosts for name resolution on both nodes as below or Configure it in DNS to resolve the IP, if you use server name instead of IP address. Read also How to Configure DNS Server on Linux (RHEL7 / CentOS7). But we use IP Address for reference. 3. Disable firewall on both nodes if enabled to avoid any issues during the configurations. Update the packages and install the puppetlabs repo using the below command. Once it is installed, you could see a repo file generated under /etc/yum.repos.d folder. Step 2: Install required package on the master node "puppet"
Step 3: Configure the puppet master server "puppet"
/etc/puppet/puppet.conf is the Puppet Configuration file, edit the file to define the friendly dns hostnames and certificate name for the puppet master node in the [main] section. After executing the below command to generate the certificate, press "CTRL + C" to cancel when you see the puppet version as below and start the "puppetmaster" service. Start and enable the puppetmaster service. Step 5: Install Puppet agent packages on the client node "client1"
Step 6: Configure the puppet agent on the client node "client1"
Again /etc/puppet/puppet.conf is the Puppet Configuration file, edit the file to define the puppet master node "puppet" in the [agent] section. Step 7: Generate the signing request certificate from the puppet agent node "client1"
Step 8: List the certificates to be signed from the puppet master node "puppet" and sign it. Start and enable the puppet agent service. Step 9: Verify the certificate signed properly with the puppet master node? More topics will be added soon. Stay connect with us. To not miss any updates, Follow us on social networking sites @Learnitguide and Subscribe us on our Youtube channel @Learnitguidenetblog.